Q. Should I get a motherboard with two PCIe x16 slots or more x1 slots? I have a MOTU 2408 audio interface and I want to upgrade from the PCI 424 host card to the PCIe 424 model, which is a single-lane (x1) PCI Express (PCIe) card. However, I need to change my motherboard before I do that. Should I get a motherboard with two PCIe x16 slots or more x1 slots? Also, how many standard PCI slots should I try to get? My SCSI card uses PCI, but I'm not sure if I need any more. I know that a PCIe x1 card, like the MOTU one, will fit into any PCIe slot but do you think manufacturers are going to put out cards with more than x1 requirements? I have read up about the benefits of PCIe and I'm surprised that more manufactures are not employing a technology that seems to solve many of the problems I have faced before, such as IRQ conflicts. 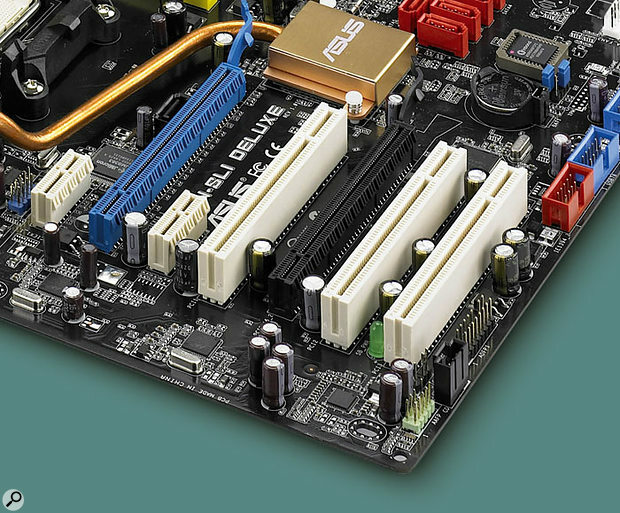 PC music specialist Martin Walker replies: Personally I'd go for more x1 slots, since even the simplest PCI Express expansion slots support an x1 link — one that has a dedicated 'lane' capable of transmitting 2.5 Gigabits per second simultaneously in each direction. With error correction it takes 10 bits to transmit an eight-bit byte, translating to 250MB/second. This is almost double that of PCI (which has a peak bandwidth of 132MB/second), and has to share its total bandwidth among all PCI slots. However, don't go away thinking that standard PCI is a wimp. On a correctly configured PC, and IRQ conflicts aside (in my opinion the vast majority of musicians don't suffer from these any more on modern PCs), a standard PCI slot is capable of running 32 inputs and 32 outputs simultaneously at 24-bit/192kHz — far beyond the requirements of many musicians (these channel figures double at 96kHz, for instance). Some musicians have even managed to run 80-in/8-out setups at 24-bit/44.1kHz with the much lower 50MB/second bandwidth of FireWire 400. So, while even a single x1 PCI Express slot is far more capable than a set of PCI slots, USB 2.0 or Firewire ports, it doesn't necessarily mean that manufacturers will be providing us with significantly more-capable audio interfaces, since in my opinion the PCI, USB 2.0 and Firewire formats are already capable of running more inputs and outputs than most of us actually need. This is also one of the two main reasons why audio interface manufacturers aren't racing ahead with PCI Express soundcards —the second being that the proportion of musicians who have PCI Express slots in their computers is still absolutely tiny. Some have now released PCI Express soundcards, but all are versions of otherwise identical PCI products, apart from Apogee's Mac-only Symphony, which provides 32 inputs and outputs at up to 192kHz, which you can achieve on a PCI card setup if you're careful. On the other hand, with so many USB and Firewire peripherals on offer, mainstream users are far less likely to use their existing PCI slots than musicians, so it seems inevitable that PCI slots will slowly disappear from motherboards over the next few years — faster than many musicians with perfectly good PCI soundcards would like. Nevertheless, most of us will continue to upgrade our computers, so PCI soundcards may disappear as well. So, to answer your original question, if you're happy to abandon any other PCI devices you currently have, you can choose a motherboard with more PCIe x1 slots; if not you'll have to accept one that offers a lesser number of each. Overall, I'm sure there will come a time when PCI Express soundcards move beyond the capabilities of PCI models, particularly if they offer on-board DSP effects as well as analogue and digital audio inputs and outputs, but rest assured that x1 slots should still be perfectly adequate for all audio duties for the foreseeable future.